This shot was taken at the end of my photowalk on EFD. The weather had been pretty nice (aka sunny) for mid march so I had loaded a roll of Kodak Kodacolor VR Plus 100 (which I rated as EI 50) that had expired in December 2000. Now the sun was setting and I wanted to get a few shots capturing the last of the sun. 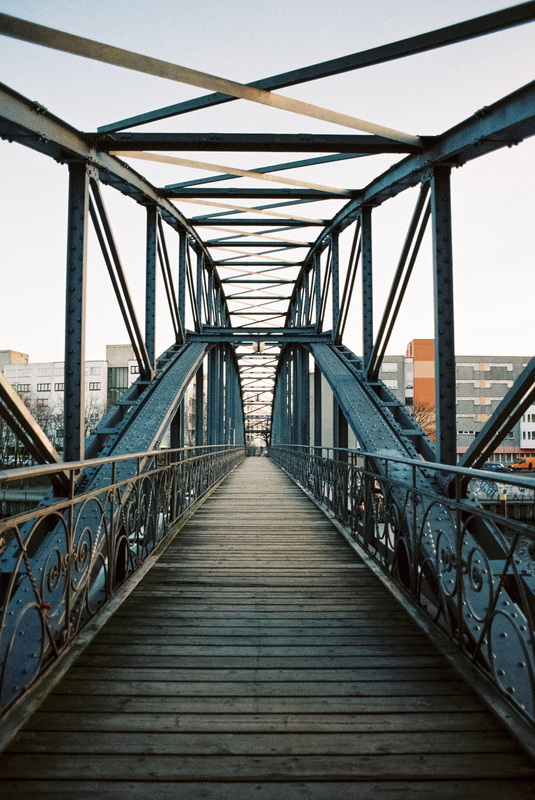 I had my Nikkor 24 mm f/2.8 AI-S attached to the Nikon FE2 when I crossed this bridge. The shot was taken at wide open at f/2.8 with a shutter between 1/30 and 1/60 of a second. The film was processed by MeinFilmLab using their standard C41 process (no push/pull) and scanned on a Fuji SP-3000.